Timothy D. Francis, M.S., D.C., D.I.B.A.K., D.H.M. Various dysfunctions throughout the body may be caused from and/or involve the chemical side of the triad of health. An efficacious procedure has been developed to determine what source (herbal, homeopathic, allopathic, and/or nutritional) the patient requires for return to a balanced homeostasis. Searching for the cause of a patient’s symptom complex can lead a clinician to explore many possibilities. 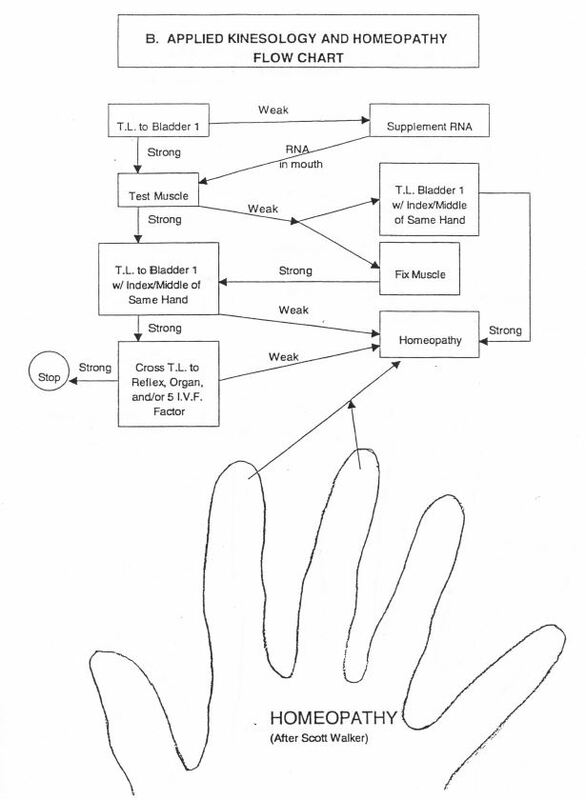 This paper explains the procedure to determine the supplemental sources (herbal, homeopathic, allopathic, and/or nutritional) on the chemical side of the triad of health that the patient requires for a prompt return to balance and harmony within the body. Due to the extremely large number of possibilities in determining which supplements a patient requires for expedient return to health, a screening procedure is required to narrow down the categories and possibilities. This paper is an expansion on the observation of Scott Walker, D.C. who originally proposed the concept that need for homeopathy could be determined by therapy localization (T.L.) 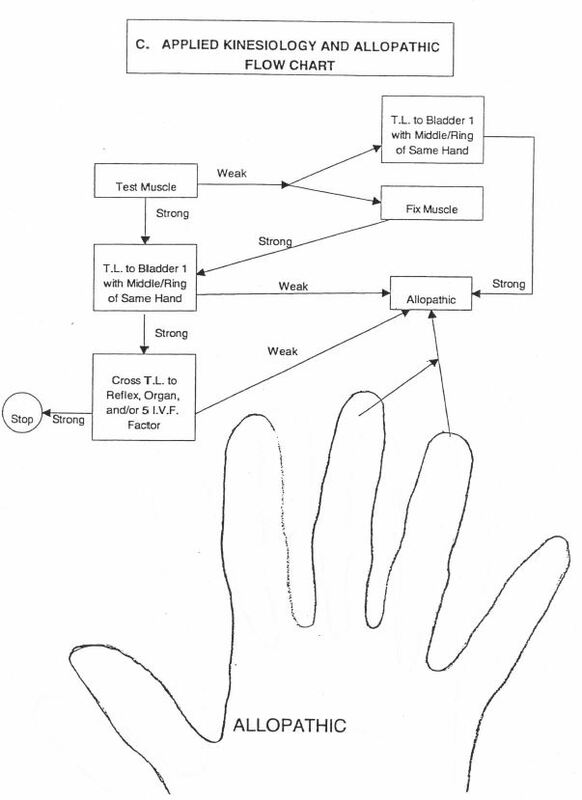 to bladder one points with the index and middle finger on the same hand while cross therapy localizing to one of the five factors of intervertebral foramen (NF), and/or an organ, and/or causing a muscle that manually tested weak in the clear to then test strong. That one observation helped to narrow down whether a patient would obtain therapeutic benefit from a class of substances known as homeopathic medicines. However, there were still the other broad classifications of herbs (naturopathy), allopathic medicines, and/or nutrition ( vitamins/minerals/glandulars ). “If the only tool you have is a hammer, you tend to see every problem as a nail.” (Abraham Maslow) The more tools you have and the better you know when and how to use them and when not to use them, the better your clinical results will be. Therefore, this author set about expanding on Walker’s original observation. Herbs (naturopathic medicines) are required when positive T.L. 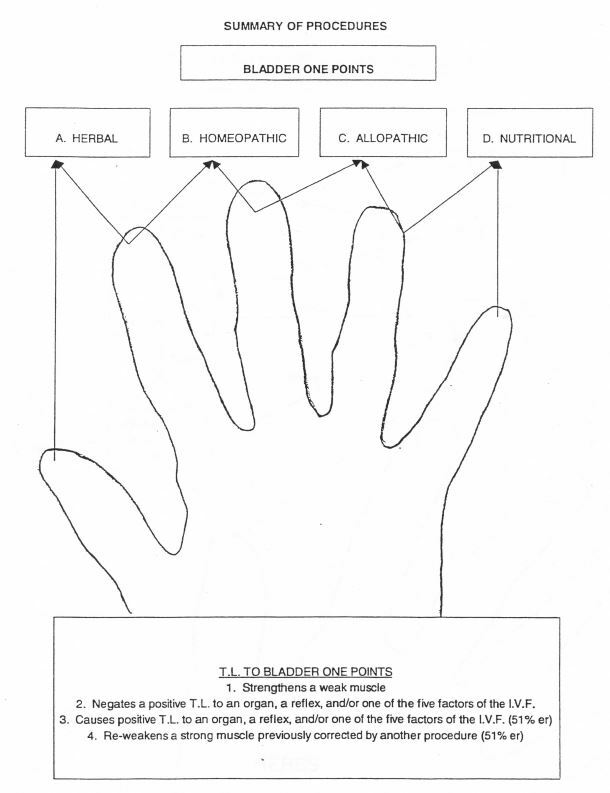 to bladder one points (utilizing the same criteria as for homeopathic medicines) via the thumb and index fingers of the same hand. Allopathic medicines are required (or referral if your license does not permit) if there is positive T.L. to bladder one points ( B.M.I. 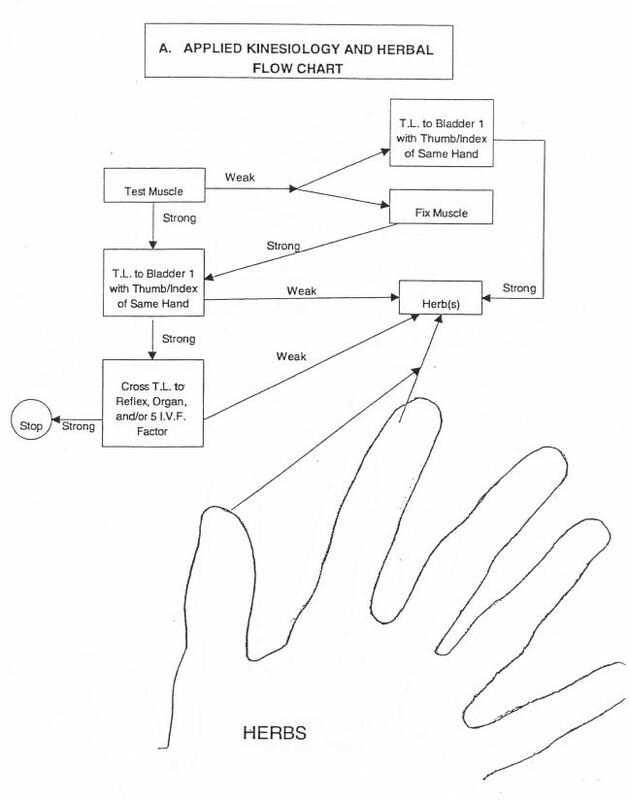 -body memory indicator) with the middle and index finger of the same hand. Nutritional supplements (vitamin/ mineral/ glandular) are necessary if there is positive T.L. with the ring and little fingers of the same hand to B.M.I. points. We then must determine thru individual testing of supplements the particulars in each case; however, this initial screening will determine the broad category required (herbal, homeopathic, allopathic, and/or nutritional) or if no supplement is required for the particular muscle/organ/reflex. This procedure allows the clinician to have at his/her disposal a reliable rapid screen for all four categories (herbal, homeopathic, allopathic, and/or nutritional) or supplements which may be required for the most efficacious approach on the chemical side of the triad of health. 1. Francis, Timothy D., “Applied Kinesiology and Homeopathy: A Muscle/Organ/Remedy Correlation,” Proceedings of the Summer Meeting of the I.C.A.K., VoL I, (197-1998). 2. Ibid. “Total Integration of Muscles, “Proceedings of the Annual Meeting of the I.C.A.K. 3. Frank, Victor, Dynamics of T.B.M. Workbook. Privately published. Sandy, Utah (1995). 4. Walker, Scott. NET Remedies, Privately Published, Encinitas, CA (1994). 5. Ibid. 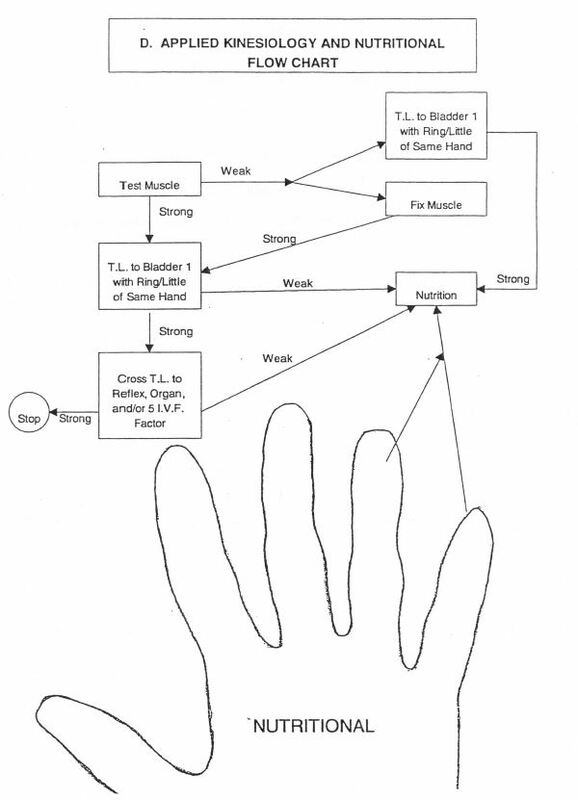 Neuro-Emotional Extra Techniques, Privately Published, Encinitas, CA (1994).